Click here for Multimedia Lecture on Heart Failure! What are the causes of CHF? What are the symptoms or complaints of CHF? How does the body respond to CHF? What are the symptoms or complaints of CHF? As noted earlier, heart failure occurs when the heart is unable to supply enough blood to meet the usual demands of the body. In the earlier example of the water pump in a valley, we discussed how the problems are twofold. The first is caused by reduced forward flow of the pump, and the second by congestion created by the "backing-up" of fluid and pressure. In the previous example, the weakness of the pump in the valley caused the fields to wither away and turn brown. This occurred because the weakened pump was unable to meet the water demands of the valley. Similarly a weakened heart reduces the amount of blood that it pumps to the arms, legs, brain and other parts of the body. When a person with heart failure exercises or performs a physical activity (walking to the mailbox, etc. 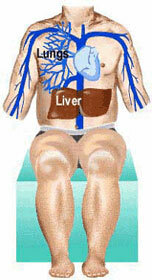 ), the weakened heart is unable to proportionately increase blood supply to the arms and legs. This results in fatigue during exertion. Reduced blood supply to the brain may cause dizziness. In the valley example, the water level increased behind the weakened pump because it was unable to push water out as quickly as it received it. Decreased forward flow of water caused all areas behind the pump to become flooded or "congested." Remember, that all organs (liver, lungs, legs, etc.) return blood to the heart. When the heart begins to fail or weaken, it is unable to pump blood forward as quickly as it receives it. This backs up fluid and increases the pressure within all the organs. LUNGS: When the lungs get congested, two things happen. Firstly, they become stiffer and it takes more of an effort to breathe. - Shortness of breath during exertion: This may be one of the earliest symptoms of CHF and patients have a rather predictable pattern. For example, shortness of breath may initially occur only after the patient has walked a mile. As CHF worsens, the shortness of breath is brought on by lesser exertion, such as walking only half a city block, or even around the house. - Requiring extra pillows at night to help breathing: A patient with CHF may have to sleep on two pillows just to be able to breathe comfortably at night. With worsening CHF, the same patient may need to prop his or her head on three or even four pillows to rest comfortably at night. - If CHF gets even worse, patients may not be able to sleep comfortably, even when they use three or four pillows. They may have to sleep sitting up in a chair or recliner. - Sudden and severe shortness of breath in the middle of the night: This problem may awaken the patient from a sound sleep and force him or her to sit or even stand up. This is known as "P.N.D." or paroxysmal (sudden onset) nocturnal (night) dyspnea (shortness of breath. Pronounced disp-nee-ya) and usually lasts around 5-15 minutes. In most cases, P.N.D. resolves as quickly and as dramatically as it occurs. - Pulmonary or lung edema: A weakened or failing heart can cause a serious build up of fluid within the lung tissue, as was seen in the "flooded valley" example. If this is severe enough, it can cause a large amount of fluid to escape out of the blood vessels. The fluid enters and begins to fill air sacs (where blood normally takes up oxygen and releases carbon dioxide) of the lungs. The fluid in the air sacs (known as alveoli; pronounced al-vee-o-lie) interferes with oxygenation of the blood and results in severe shortness of breath. This can occur any time of the day or night and is a medical emergency that requires treatment in a hospital. LEGS, ANKLES & FEET: Blood from the feet and legs is returned to the heart. In a weakened or failing heart, there is a back-up of fluid and pressure in these areas since the heart is unable to pump blood as promptly as it is received. This increased congestion within the feet and legs causes fluid to "seep" out or escape from the blood vessels. The free fluid makes its way to the area below the skin and fatty tissue. The feet. ankles and legs begin to "bloat up" with fluid and increases in size causing edema (pronounced ed-ee-ma) or swelling of the legs. INCREASED BODY WEIGHT: As a result of edema in the legs and other parts of the body, more than 10 pounds of free water may be present in the tissue of the body. In addition to the feet and legs, the fingers and hands may also swell and wedding bands may suddenly become too tight. Fluid may also escape within the cavity of the abdomen causing the belly to appear swollen and clothes to feel tight.